Whether at your office desk or behind the wheel for work, sitting for hours at a time can negatively influence numerous physical health indicators, including muscle tone, blood pressure, energy level, chronic tension, and aerobic fitness. The human body is designed to move, and failure to do so can result in severe long-term consequences. Heart rate training (cardiovascular exercise) is a great supplemental practice to maintain good health. However, most jobs that require you to sit for extended periods of time can make it extremely challenging to find the time and energy to perform aerobic exercise. Fortunately, heart rate training is done best in short periods of time at higher intensities. 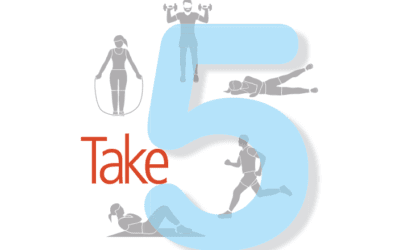 This means a shorter — and oftentimes more efficient — workout can be done anywhere. Your aerobic fitness level is based on your heart’s ability to perform work efficiently at an increased heart rate and then recover quickly back to resting heart rate. Like your biceps, quadriceps, back, chest, etc., your heart is a muscle. And like all muscles, we must train it to be stronger and more fit and to have endurance. The heart is exercised when we raise the heartbeats per minute for an extended period of time and then recover. There are numerous variations of heart rate training, but interval training is a common and well-known form. High Intensity Interval Training (HIIT) is designed to raise the heart rate for short bursts of time followed by some form of recovery, and then is repeated again for several rounds. This form of training can be done with just your body weight, which makes it an attainable and realistic form of training for most individuals in any setting. HIIT in the workplace can be done quickly and throughout your day. Aside from the cardiovascular benefits such as lower blood pressure and improved circulation, aerobic training helps mental focus and concentration, sustains energy and improves metabolism — all aspects of functioning that could drastically enhance your efficiency at work. 1. Plank Walk Out. Stand upright with a tall spine. Inhale and raise your hands up over your head. Exhale and fold forward toward the floor, bending your knees as much as you need to. Place your hands on the floor in front of you and walk them forward until you are in a plank position (wrists stacked right underneath your elbows and shoulders). Inhale and begin to walk your hands back toward your feet, and breathe your way all the way back up to standing, reaching your arms up overhead. This is one repetition. Repeat as many rounds as possible in one minute. Be sure to breathe continuously. 2. Jumping Jacks OR Sliding Jacks. If you are not able to jump, you can do Sliding Jacks. To perform sliding jacks, stand tall and upright. Engage your abdomen by pulling the belly button in toward the back of the ribs. Bring your arms up overhead, like in a jumping jack, while simultaneously extending one leg out to the side, keeping your foot in contact with the ground. Keep a slight bend in the standing leg and your weight on that heel. Exhale and quickly shuffle your feet back together before switching the other leg out to the other side, bringing the arms back down. Quickly do the same movement on the other side, shifting the other leg out to the side. Pick up the pace and shift side to side as quickly as possible for one minute. Be sure to breathe continuously. 3. Stair Walk OR Standing High Knees. If you are fortunate enough to have stairs at your workplace (or unfortunate enough, some would say), take advantage of this great tool foraerobic fitness. Take a two-minute break to perform one minute of continuous walking up the stairs as quickly as you can. When stepping up, be sure to press into the heel of the foot to lift yourself. If you do not have access to stairs, you can perform standing high knees wherever you are. For one minute, alternate bringing your knees up to hip height (or higher) and lightly lowering your feet back down to the floor (as opposed to stomping them down). Arms should be bent at your sides, and your abdominal muscles engaged. Complete the movement as quickly as possible for one minute. Be sure to breathe continuously. Extra Help: Bodyweight Squats. Stand with your feet just wider than hip-width apart with your toes turned out slightly. Keep your spine long and stand up straight with tall posture. With your chest high, inhale and begin to bend into the knees, shifting your weight into the heels (you should be able to wiggle the toes freely when you are at the very bottom of your squat) and reach your hips far back, as if you are reaching to sit in a chair. Your knees should never go forward over the toes. On an exhale, keep your abdomen tight and power yourself back up to standing by pressing through the heels. Squeeze your glute muscles when you are standing. Once you get comfortable with the form, speed up the pace, without losing the posture and form, and do as many consecutive squats as you can for one minute. Be sure to breathe continuously. Try completing each of these exercises for one minute each throughout your day. For example, perform two of the exercises for one minute each before lunch and then the final two after lunch, each at different times. Laurel Dierking, MEd, NFPT, 200-YTT, is a health and fitness professional and yoga instructor with seven years of experience who tailors her training to individual clients’ needs. She has an extensive hands-on background in exercise physiology, yoga, and individualized wellness training, with a focus on improving the mind and body connection by guiding individuals through mindful movement, functional training, body awareness, and breath work.